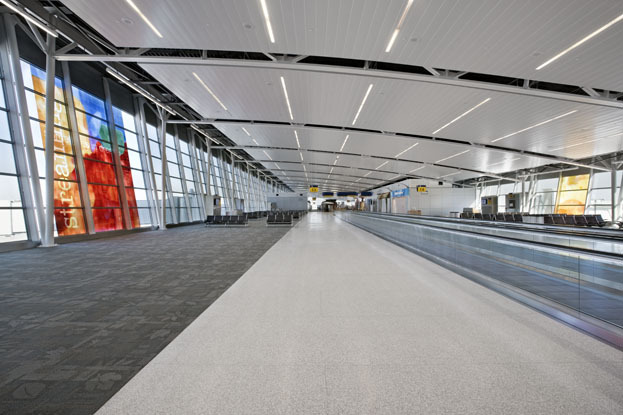 For more than 30 years, plans have been in the works to overhaul and redesign the Indianapolis Airport to create a state of the art terminal that is timeless in design and flexible enough to grow and change with the times. This November, the city unveiled the largest development initiative in Indianapolis' history. 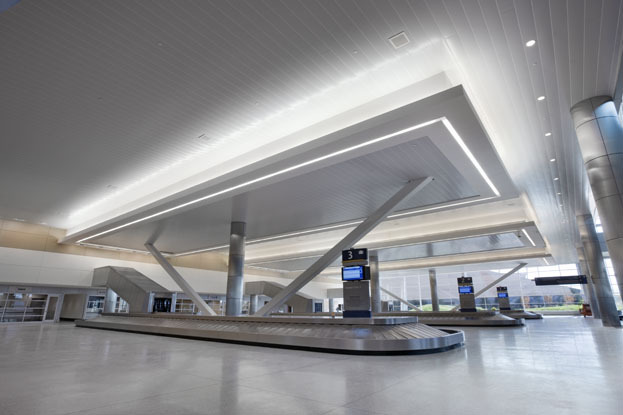 Designed by HOK, one of the leading airport terminal architects, the curved roof of the new Indianapolis International Airport acts as a symbolic gateway to the region. As the first airport that has been built from the ground up since September 11th, 2001, Indianapolis is ready to greet visitors with a modern facility equipped with the latest design, security and sustainable features. 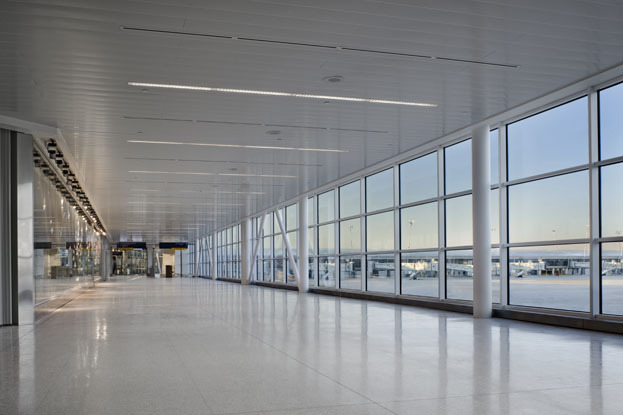 Situated 16 miles outside the city center, the new dual-level terminal sits midfield between the two main runways. 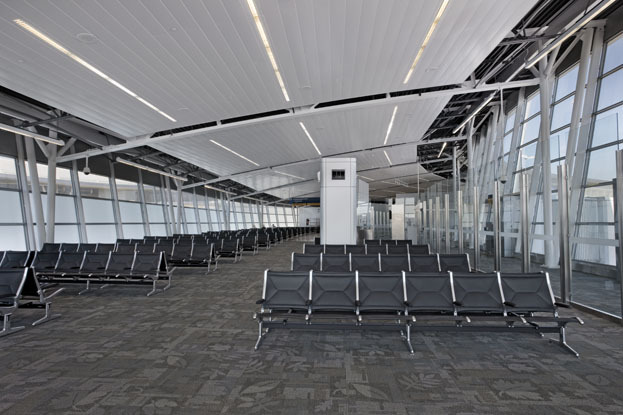 In addition to 40 gates that are equipped to meet the needs of narrow and widebody aircraft, the building houses all ticketing and check-in activities as well as security, baggage claim, US Customs and Border Protection facilities. 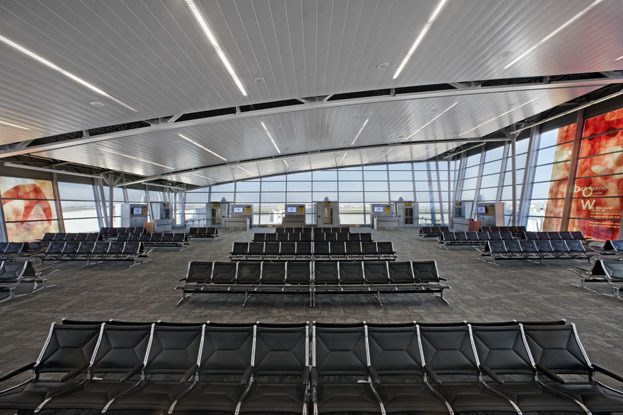 The heart of the 1.2 million square foot terminal is Civic Plaza, a central gathering point that is reminiscent of Indianapolis' central public space, Monument Circle. Highlighted by a 200-foot wide skylight, Civic Plaza provides travelers with necessities such as concessions, retail stores and security while incorporating artwork and public event space. Besides creating a dynamic space filled with art, retail stores and concessions, the architects and designers were tasked with keeping sustainability top of mind as well. 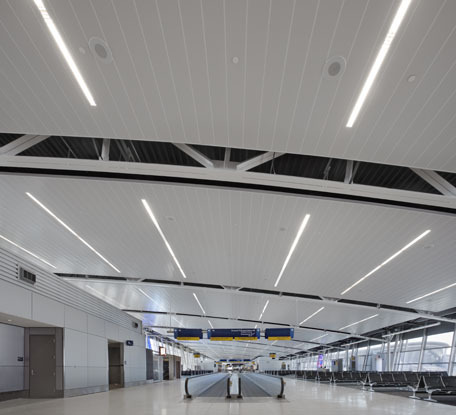 As a new construction the airport had the opportunity to use the latest energy efficient architectural designs and energy management systems. 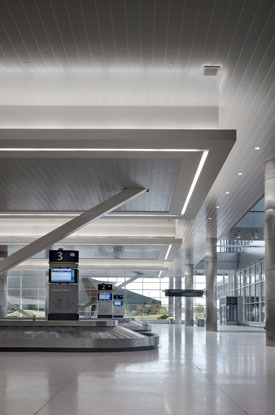 In fact, even the 55 linear miles of main ceiling panels contribute to sustainability. 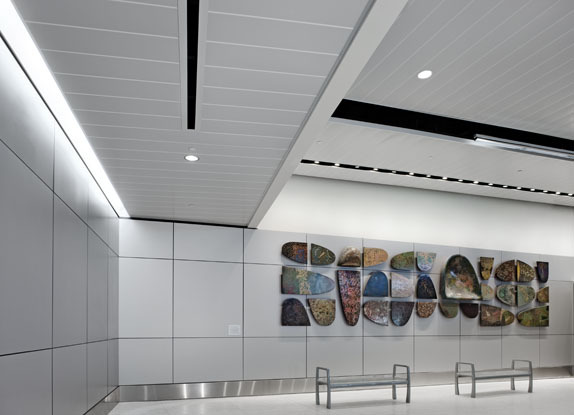 The 300C metal ceiling panels from Hunter Douglas Architectural Products are installed in the concourses, security screening checkpoint areas, public corridors, baggage claim areas and between the girders of the pedestrian bridge art installation. These panels are made of more than 70 percent recycled material and were specified to meet the needs of the space. Additionally, they contribute to indoor air quality ratings since they have no VOC's. 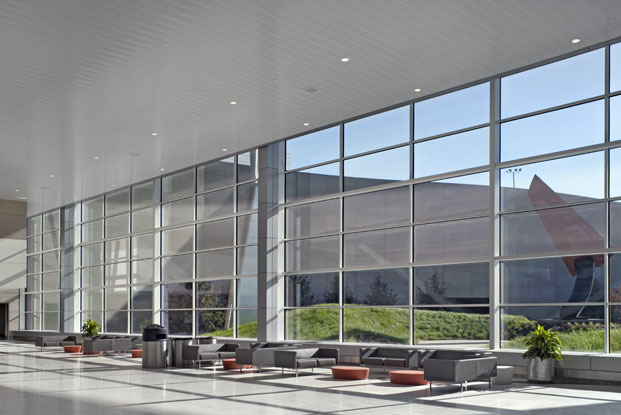 The selection of the Hunter Douglas 300C panels supported the airport's overall goal of flexibility and ability to respond to change easily. "This product provides a durable, acoustical solution with easy access to the plenum without tools." said Mary Inchauste, AIA, LEED AP, IIDA of AeroDesign Group. "Even during construction, this proved to be invaluable as the various trades worked to install electrical, lighting, public address systems, fire protection and security systems by easily removing the panels." In addition to providing easy access to building systems, the large panel size creates fewer seams and joints giving a clean, monolithic appearance. With a maximum panel length of 19 feet 8 inches and width of 11.8 inches (300 mm. 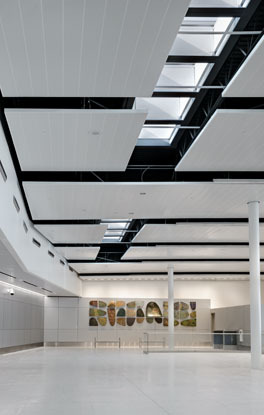 ), these panels are able to span a greater distance, accommodating an expansive project space such as an airport. 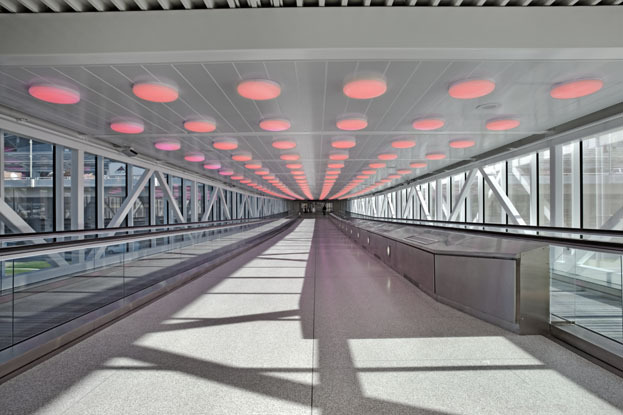 The Indianapolis International Airport is expected to earn a LEED Silver rating for daylighting, energy efficiency, sustainable materials, water use conservation, indoor air quality and recycling program.